Twenty-four former Nazi officials were tried, and when it was all over, one year later, half would be sentenced to death by hanging. On this 20th day of November in 1945, a series of trials of accused Nazi war criminals, conducted by a U.S., French, and Soviet military tribunal based in Nuremberg, Germany, begins. These trials of accused war criminals were authorized by the London Agreement, signed in August 1945 by the United States, Great Britain, the Soviet Union, and the provisional government of France. It was agreed at that time that those Axis officials whose war crimes extended beyond a particular geographic area would be tried by an international war tribunal (a trial for accused Japanese war criminals would be held in Tokyo). Nineteen other nations would eventually sign on to the provisions of the agreement. (4) conspiracy to commit any and all of the crimes listed in the first three counts. 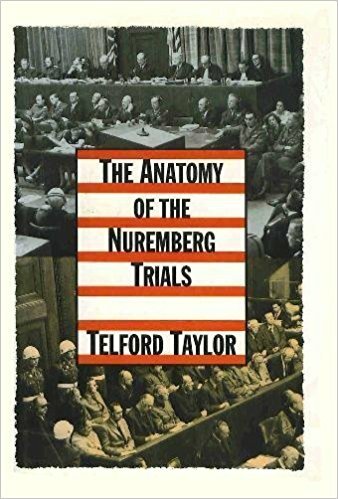 Buy on Amazon.com – A key member of the prosecution team at the Nuremberg war crimes trials offers an eyewitness account of the tribunal, shedding new light on the accused top-echelon Nazis, the events of the trials, the verdicts, and more. The tribunal had the authority to find both individuals and organizations criminal; in the event of the latter, individual members of that organization could then be tried. Each of the four original signatories of the London Agreement picked one member and an alternate to sit on the tribunal. The chief prosecutor was U.S. Supreme Court Justice Robert H. Jackson, who was asked by President Harry S. Truman to create a structure for the proceedings. The defendants were arrayed in two rows of seats; each of the indicted listened to a simultaneous translation of the arguments through a headset. 12 of the defendants were sentenced to be hanged, including Julius Streicher (propagandist), Alfred Rosenberg (anti-Semitic ideologue and minister of the occupied eastern territories), Joachim von Ribbentrop (foreign affairs minister), Martin Bormann (Nazi Party secretary), and Herman Goering (Luftwaffe commander and Gestapo head). Ten of the 12 were hanged on October 16. Bormann was tried and sentenced in absentia (he was thought to have died trying to escape Hitler’s bunker at the close of the war, but was only declared officially dead in 1973). Goering committed suicide before he could be hanged. The rest of the defendants received prison sentences ranging from 10 years to life. All of the defenses offered by the accused were rejected, including the notion that only a state, not an individual, could commit a war crime proper. and what did the world learned from this ? Just how to do the crimes more silently.